This spacious restaurant has been designed with the comfort of the diner in mind. All dishes on the menu are specially conceived by the very experienced chefs and most are unique to Maurya. 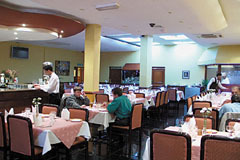 The restaurant is a perfect location for parties and functions as there is a very comfortable waiting area, a large and attractive bar and a professionally laid dance floor. To make your party a success, Maurya will be pleased to arrange discos and classical Indian music nights on request. Open every day for dinner 6-11pm and Wed-Sun for lunch 12-3pm. All major credit cards accepted (not Diners). 10% service charge (optional).